Gary Williams knows one answer to the IT-OT security schism. Williams, the Schneider Electric Senior Director of Technology, Cyber Security and Communications, found a case where IT and OT were not working well together so the manufacturer sent IT and OT practitioners to school to learn about each other’s area of expertise. 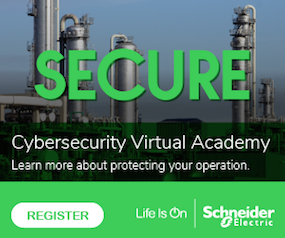 “What we have is a mismatch in environments,” said Andrew Kling, Director of Cybersecurity and Architecture at Schneider Electric. “It’s a mismatch in products executing in the environments; the environment is changing very fast, but the products in those environments aren’t. At the plant level, the cyber environment is evolving at a very rapid pace, but the technology inside is not. For a user to say they are going to keep up with the evolutionary speed of the cyber realities of the world, would be a significant statement, not even necessarily feasible from a business standpoint. That changing environment means more sensors, more connections coming from across the Internet – in other words the Industrial Internet of Things (IIoT). If you look at A typical process plant cluster, which has around 40,000 sensors. Add IIoT on top of that and it will increase those numbers to something over like 250,000 sensors or more per plant. IIoT will help solve key business issues all plants face in terms of production efficiency, process reliability and safety, along with moving ancient legacy systems into the new age. But because of the sheer volume, it is forcing IT and OT to work together to enable the manufacturer to take advantage of all things new technology and connectivity bring. “You have to understand the business outcome,” said Caglayan Arkan, general manager of Microsoft’s worldwide manufacturing and resources sector enterprise and partner group during a panel discussion at an industry conference. It is easy to say IT security is years ahead of OT, and the manufacturing sector can learn from that. While that is true, Williams has a different perspective. When it comes to IT-OT convergence, you can go to school and know there has to be a “meeting of the minds” between the two, but it will take some time. Gregory Hale is the Editor/Founder of Industrial Safety and Security Source (ISSSource.com).